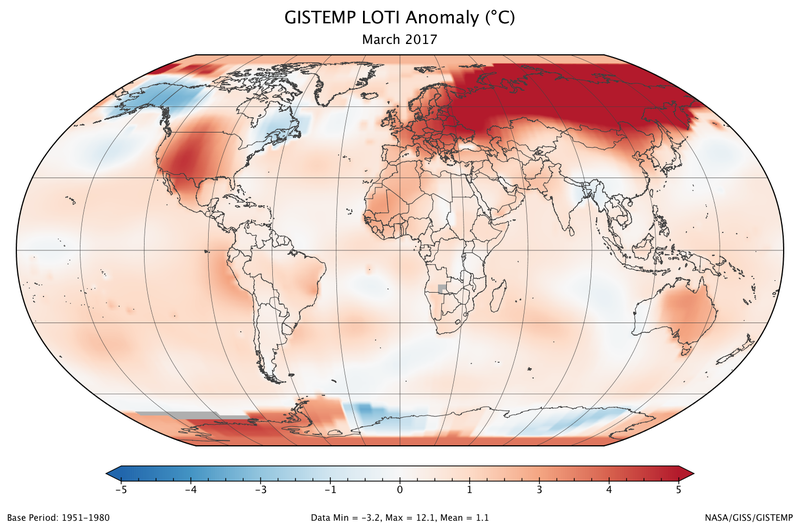 In the past 137 years, there’s only been one March hotter than March 2017, and it was March 2016. That’s according to the latest iteration of NASA’s global temperature dataset, released today, which points to the dreadfully predictable conclusion that our round Earth is still getting hotter. Scientists know the Earth is warming because of temperature records, including NASA’s and NOAA’s, which stretch back to the late 1800s and show the planetary thermostat rising roughly a degree Celsius over that period. We know that the heating is due mainly to carbon dioxide, because the concentration of this heat-trapping gas has risen more than a third in our air since the Industrial Revolution, and we’ve ruled other explanations out. We know that humans are producing the carbon dioxide at an alarming rate because of the aforementioned cars and air conditioners and burgers. We know that if we keep heating the Earth, sea levels will keep rising, ice caps will keep melting, and a bunch of other bad stuff might happen but we’re still working all of that out. We know that the far-future solution to this planetary problem may be fusion energy if only we could bother to fund it, or maybe a bunch of us ought to take our sweaty bodies and our global warming to Mars (maybe we won’t even have to nuke the Red Planet to heat it up), but right now, we probably ought to cut back on the CO2. And we know that we’re not cutting back fast enough because carbon in the air is still going up and we’re still writing posts like this. So, what’s an average human being living on this round blue ball in the early 21st century supposed to do about it? Go eat a burger, enjoy this strangely warm Friday which I can’t attribute to climate change because weather does not equal climate and meteorologists will yell at me on Twitter if I tell you otherwise, and then maybe, if you’re feeling brave, tell your weird uncle that last month was 1.12 degrees Celsius warmer than the mean March temperature from 1950 to 1980, 2016 surpassed 2015 surpassed 2014 as the hottest year on record, and NASA’s Earth science division does some damn good work. Or don’t, I won’t blame you. Just think about the spaceship that supports you once in a while. We’re all in it together.